Editor’s Note: Pillars initially featured Christian Freeman in a 2011 article about his participation in the Loyola Institute at Le Moyne College. All that hard work has started to pay off for Christian Freeman. The 2012 graduate of Bishop Grimes Prep spent many extra hours in high school pursuing college level courses through Le Moyne College’s Loyola Institute. 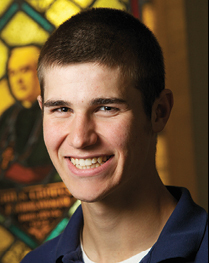 Today, he is a freshman at Canisius College in Buffalo, NY, majoring in biology on a pre-med track. The Loyola Institute was created by Le Moyne College as an opportunity for diocesan students to earn college credits and scholarships, as well as a way to encourage students and their families to extend Catholic education in the Diocese of Syracuse through to the college level. Students must be accepted into the program and complete a series of rigorous courses on their own time from 10th through 12th grade. At the completion of the program, participants have earned 12 college credits. Those interested in attending Le Moyne after high school graduation will, upon admission, begin their college studies with a semester’s worth of courses already behind them – and significant tuition savings. Credits can also be transferred to many other colleges and universities, as can the valuable lessons learned both in and out of the classroom from the experience.